When I was asked to take over as scientist-in-charge of the Yellowstone Volcano Observatory (YVO) in 2002, I was unaware that soon I would be responding to a rapidly growing urban legend (or perhaps a rural one in this case). Just Google for the words Yellowstone and Doomsday, and youll find hundreds of entries from scores of Web sites warning that the world is about to end at the hands of Americas first national park and largest restless caldera. In the BBC-Discovery Channel docudrama Supervolcano, Yellowstone volcano erupts violently, sending hundreds of cubic miles worth of debris into the atmosphere and creating plumes of ash and debris that race at hundreds of miles an hour. Although this type of eruption has happened in the geologic past, scientists say an eruption of that magnitude is unlikely to happen anytime soon. Courtesy of Discovery Communications. Of course, the Yellowstone caldera is a volcano, and it almost certainly will erupt again someday. Its possible, though unlikely, that future eruptions could reach the magnitude of Yellowstones three largest explosive eruptions, 2.1 million, 1.3 million and 640,000 years ago. Smaller eruptions, however, are far more likely, and no eruption seems imminent on the timescale that most people truly care about  their lifetime or perhaps even the next few hundred or thousands of years. These realities, however, do not always make it into the coverage we see in TV documentaries, on the Internet or in the popular press. Sometimes, the media bends the realities to make for better entertainment rather than better science, as evidenced by my experiences over the past three years evaluating everything from fictional movies about Yellowstone to dispelling myths on Internet chat rooms. So, why all the attention on Yellowstone volcano now? Although scientists first recognized Yellowstones history of repeated titanic eruptions back in the 1960s, the general public became aware of them only during the past five years or so. The upsurge in interest can be tied partly to the release of an episode of the BBC-produced Horizon in 2000, which addressed volcanic eruptions at Yellowstone and was frequently replayed in the United Kingdom and in North America on the Discovery Channel. Around the same time, the U.S. Geological Survey (USGS) signed a memorandum of understanding with the University of Utah and Yellowstone National Park to create YVO. The idea was to formalize what had been an unofficial observatory for many years and create a stronger framework for monitoring and research. A few years later, in late 2002, a number of geological factors contributed to ramping up public interest in Yellowstone and its volcanic potential. First, surface waves from the magnitude-7.9 Denali, Alaska, earthquake triggered about 400 small temblors within the park, 3,100 kilometers (about 1,900 miles) distant from the epicenter. Next, Steamboat Geyser, Yellowstones tallest and most unpredictable geyser, erupted in March 2003 and again in April and October. A new and vigorously steaming 75-meter (245-foot) line of steam vents erupted within sight of the Norris-Mammoth Road. A trail in the Norris Geyser Basin was closed because of increased steaming and resulting elevated ground temperatures. 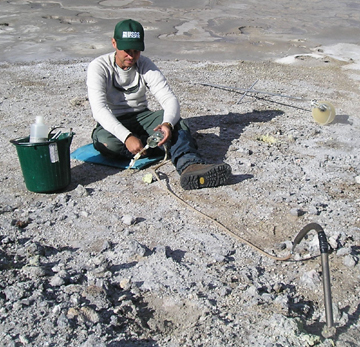 Our coordinating scientist Robert B. Smith of the University of Utah spearheaded a seismic and GPS-based experiment trying to understand the nature of the changes to hydrothermal features at Norris. At the same time, new USGS mapping of thermal features on the floor of Yellowstone Lake resulted in a flurry of articles on Yellowstones potential for hydrothermal explosions  events in which geothermal groundwater is flashed to steam, hurling rocks substantial distances and forming craters. These articles reasonably highlighted the active thermal features beneath the lake and the importance of hydrothermal explosions, but they also incorrectly implied that active bulges were rapidly forming beneath the lake, that they were ready to explode, and that they could cause volcanism in their wake. 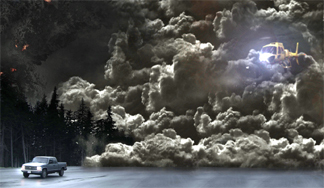 With all this attention on Yellowstone late in 2003, BBC Science decided to produce a two-hour docudrama on the volcano and its potential for widespread devastation. Entitled Supervolcano, it chronicles a near-future cataclysm modeled after the Huckleberry Ridge eruption 2.1 million years ago, which vented more than 2,500 cubic kilometers of volcanic debris (enough to bury the state of Texas 12 feet deep). The BBC movie cost approximately $5.5 million to make and was co-produced with Discovery Channel, NHK and several other global television interests. It premiered in the United Kingdom in March and in the United States in April. Jake Lowenstern, real-life scientist-in-charge of Yellowstone Volcano Observatory (YVO), collects geothermal gas in the field. In the docudrama Supervolcano, Michael Riley plays the scientist-in-charge of YVO (Rick Lieberman), and he consulted with Lowenstern on everything from dress code to pronunciation of geologic terms in preparation for his role. Image courtesy of Fraser Goff, USGS. Scientists from USGS, Yellowstone National Park, the University of Utah and elsewhere in academia were visited by the films producer and writer, prior to filming. They asked us countless questions during script development, including the following: How do you monitor the volcano? What phenomena imply an eruption? Who is responsible for what tasks? What do you do in the field? Where do you stay? How do you get around? Later, we reviewed a draft script for the drama and provided them with our comments and critiques. Michael Riley, the actor playing the YVO scientist-in-charge, phoned me twice, and we had lengthy conversations about topics ranging from my typical day to dress code to the proper pronunciation of place names and geological jargon. In the end, the BBC Science team did an impressive job of addressing the sorts of scientific issues we would grapple with during the start of an eruption. The drama unfolds as a true scientific thriller, both gripping and fact-filled. The characters, though based only loosely on real people, had motivations and interests similar to mine and those of my colleagues. Although we strongly would have preferred portrayal of the effects of a small eruption, their intent was always to provide a worst-case scenario, and the final product did that very well. Surprisingly, our experience with two documentary film programs was somewhat more negative. Both BBC and the National Geographic Channel requested our assistance on documentaries that would explore the effects of supereruptions. The BBC program followed its showing of Supervolcano, while the National Geographic program was for its series Naked Science. My naïve assumption was that the filmmakers would interview their subjects and then synthesize the results of what they had learned. In both cases, though, we felt as if our roles had been scripted beforehand and that the filmmakers relentlessly pursued several key quotes that fit neatly within their desired narrative. We were never given the opportunity to critique the Naked Science program, and the final product was highly sensationalized. The BBC did allow us to view an early version of their documentary, one which we felt was highly misleading about actual geologic hazards and risks at Yellowstone National Park. Their revised program, entitled The Truth About Yellowstone, was broadcast in the United Kingdom and elsewhere overseas. Although it was much better than the earlier draft, it tended to focus more on corroborating Supervolcano than on providing an unbiased assessment of current events and likely volcanic scenarios. Discovery Channel opted to replace The Truth About Yellowstone with its own documentary hosted by Tom Brokaw. Overall, that documentary was balanced, providing both the science and the sensational with appropriate perspective. Under Pressure? Yellowstone may be getting ready to erupt, scientists say. This alarming headline grabbed many readers attention in Longmont, Colo., in December 2003. Actually, the associated article in the local paper, the Times-Call, was quite good and with the exception of the headline, made no mention of any scientists who thought Yellowstone might be getting ready to erupt. Ive since learned that headline writers dont always worry too much about matching headlines to storylines. They can creatively embellish the fundamental science without any serious consequences, at least to themselves. And that was true to a limited degree for the wide range of coverage Yellowstone has received in recent years in the New York Times, the Los Angeles Times and CBS News, among many, many others. Coordinating scientists Robert Smith, Henry Heasler (the park geologist) and I have done interviews for scores of newspapers and magazines (including Geotimes), as well as television and radio news stories, some of which were accurate and reasonable, whereas others were sensationalized and twisted. Generally, the most carefully researched articles about volcanism at Yellowstone were penned by writers from the local newspapers in Billings, Mont., Jackson, Wyo., and other nearby towns. This paralleled my experience at Mount St. Helens in October 2004, where the local writers were more likely to take the time to get the story right. When confronted with a litany of potential eruption scenarios, local reporters covering Mount St. Helens thoroughly educated themselves about the volcano, its history and the techniques used to monitor volcanic activity. They did not want to overstate the danger once they understood that a relatively nonhazardous effusive eruption was underway. 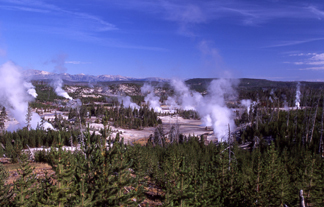 The Norris Geyser Basin in Yellowstone National Park, shown steaming here in August 2003, is home to many hydrothermal features, which are fueled by an enormous magma chamber seated below much of the park. Image courtesy of Jim Peaco/NPS. Needless to say, these statements were not true, and someone did not do a very thorough job of fact checking the story  but that did not stop dispersal of these misleading reports all over the Internet. Similarly, an online Web forum reported that USGS had secretly sent 200 geologists into Yellowstone to study the situation. I can only dream that USGS had such resources! Most of these articles referred to generic scientists who were worried about one thing or concerned about another. None of these people were ever mentioned by name, and I certainly have not met any of these generic scientists  but they sure did seem worried. As a result of these stories, enthusiasts flocked to our real-time data on seismicity, ground deformation and stream flow, looking for any anomaly that might foreshadow an approaching eruption and devastation. Their musings provided fascinating, but unsettling, reading for YVO scientists. Wind, trucks and snowmobiles were interpreted as tremors, swarms and other signs of instability. Although the denizens of these chat rooms may have had scant geological education, they were passionate. One online forum sent us a series of penetrating questions about how we monitor Yellowstone. Smith, Heasler and I responded, knowing that our words would be posted on their Web site. Although we were unsure whether answering was a good idea, in the end, we responded as forthrightly as possible. While answering their questions, we admitted that our monitoring system could not predict certain kinds of events (for example, localized steam or hydro-thermal explosions), that we do not monitor gas flux or composition in real time, and that there are many topics that earth scientists still do not understand. Our letter was painstakingly analyzed by many in their group, some of whom still accused us of obfuscation and evasion. We soon noted, however, a significant curtailment in their concern  messages to their Yellowstone chat room slowed to a near halt. Overall, I think we gave them what they needed, and we turned a few skeptics into grudging admirers. My experiences over the past few years have necessarily caused me to reflect on the public face of science, scientific information and scientists themselves. Prior to my role at YVO, Id worked as a full-time researcher on the geochemistry of magmas and their related hydrothermal systems. I recognized that although my research was relevant to volcanology and economic geology, it explored subjects too arcane to be of much interest to the public. My focus was toward other scientists, and when reporters did venture near my door, I was challenged to convey properly the significance of my work while keeping things simple, technically accurate and appropriately reflective of work done by others. So it came as a bit of a shock when regardless of anything Id actually done as a research scientist, I was now solidly in the role as the point person for a whole host of critical questions. Will it erupt? Why not? When? How do we know? Its been a fascinating transition  one that was not necessarily desired, but that has taught me useful lessons in communicating technical information to a public that truly cares about what scientists say and how we say it. These lessons hold true for people dealing with media in any profession, not just the earth sciences. The first lesson is not to talk about a sensitive subject unless youve thought about it before, talked about it with others and gotten some feedback. Fortunately at YVO, we have three coordinating scientists with varied expertise and different home institutions, so we have natural checks and balances when we communicate to the public. Weve learned that its critical to keep things as simple as possible. If youre trying to answer a question, do not give an answer that will spark two more questions. And while there may be 10 different possible ways to answer a technical question, theres always one that is a bit more direct and more intuitively satisfying, and thats the one you should use. Second, tell the truth and admit when you dont know something. If you tell the truth as you see it, many will still call you a baldfaced liar. If you choose to hide anything, theyll know you are one. And last, dont confuse enthusiasm with good outreach: It may work for high school kids but it wont work with the New York Times or nightly news hours. When we get too casual or enthusiastic, our words come back to haunt us. Our excitement about understanding earthquakes, volcanoes, hurricanes and floods can be misinterpreted. Reporters may confuse our reconstruction of past events with a prediction of future events. Ultimately, the latter holds their interest. In the end, the reporters and filmmakers have the final say. They write the articles and scripts, they choose the quotes and sound bites, and they have the attention of the public. When they work hard to get the facts correct, it pays off. The Supervolcano drama was successful in large part because it was authentic, making the plot more gripping and the whole experience more educational. When the science is ignored, or misunderstood, everyone loses. The challenge for us scientists is to relay both the details and the context of our work, so that society understands that science is ultimately a human endeavor  sometimes uncertain, often complex, but always exciting. Examples of volcanoes that have produced exceedingly voluminous eruptions and formed large calderas in the past 2 million years include Yellowstone, Long Valley in eastern California, Toba in Indonesia and Taupo in New Zealand. Other supervolcanoes would likely include the large caldera volcanoes of Japan, Indonesia and South America, among others, according to USGS. Lowenstern is scientist-in-charge for the Yellowstone Volcano Observatory and is based at the U.S. Geological Survey (USGS) in Menlo Park, Calif. The observatory is a partnership between Yellowstone National Park, USGS and its Volcano Hazards Program, and the University of Utah, which operates the earthquake and ground-deformation monitoring networks.